Michael "Mike" Lee Jessup, 55 year old Coast Guard Veteran of Clarkton passed away on Tuesday, October 9, 2018. He is preceded in death by his parents: Nathan McDuffie Jessup Jr. and Barbara Ann Bennett Capehart, one brother: Wayne Michael Jessup, and paternal grandparents: Nathan McDuffie Jessup Sr. and Nada Jessup. Mike leaves behind his mother: Carol Jessup of Elizabethtown, his faithful furry best friend: Champ, one brother: Bill Jessup of Elizabethtown; and one niece Sabre Jessup. Mike was a genuine loving guy who cared for everyone. He especially enjoyed spending time with his mother, family and friends. His niece Sabre had a special place in his heart. 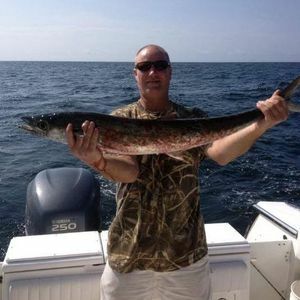 Mike felt most at home when on the water or in the woods, hunting and fishing. He absolutely loved animals. Mike was the kind of person that would do anything for anybody and ask nothing in return. A kind hearted soul that has left an empty spot in the hearts of all that knew him. Mike was an active volunteer and member of the Quality Deer Management Association, local and National Ducks Unlimited Chapters, and the National Rifle Association. The family requests for those who desire to make memorial donations in memory of Mike to any of the foundations referenced herein. The family will receive friends from 4-6 pm on Saturday, October 13, 2018 at Bladen Gaskins Funeral Home in Elizabethtown. A memorial service will be held on Sunday, October 14th at 2:00 pm at Wesley's Chapel United Methodist Church in Elizabethtown with Rev. Darrell Copeland and Rev. Frances Daniels officiating. Add your thoughts, prayers or a condolence to Michael Lee's guestbook.